Lead Marshall Anthony Rilley hands information to Greg Agosto at the Veterans and Military personnel career fair at Harbor Point Square in Stamford on Wednesday, August 8, 2012. Finding jobs in this economy can be a challenge, but when searching is coupled with readjustment to civilian life, the transition can be even more difficult. So 65 area companies gathered at the headquarters of Building and Land Technology in Stamford on Wednesday and offered a career fair for veterans and members of the military. The event was sponsored by BLT and southernctjobs.com, a division of Hearst Media Services CT.
Exhibitors looked for a range of qualities in candidates who approached each booth. Some offered positions with specific qualifications in mind, while others left the field open. "What I look for is someone's motivation, energy level, presentation skills and then everything else will follow," Stacey Dattorre, human resources manager at WWE, said. "But initially, it's someone's energy." The event was initiated by BLT, which hopes to continue host and sponsor programs. 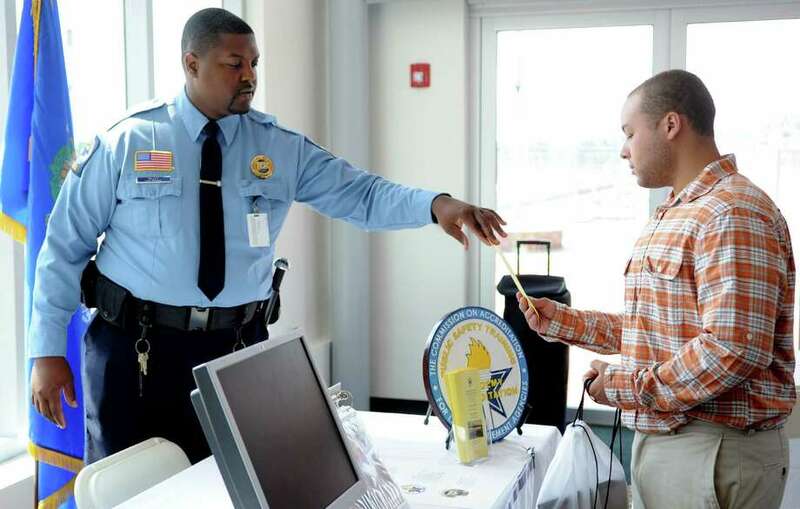 Career fair organizers expected to bring in 250 or more job seekers. "We're very excited to give back," TJ White, director of marketing at BLT, said. "There's a tremendous amount of jobs available and the goal is to put our vets to work." Several job seekers came with open minds about the sort of work they would like to get into. "I'd like to just find a job," Dwayne Wigglesworth, of Bridgeport, said. "I'm just seeing what the options are." Many of the recruiters behind the booths expressed a hunger for new talent, as well as a desire to help veterans who, after serving their country, are looking to settle into a second career, or seeking to finish their education. For many employers, the military training that a veteran has received is a bonus in a civilian position. "They protected us, so we should return the favor and provide security for them and their families," said Amy Cagginello, director of the ecological and incentive division at Main Enterprises in Stratford. "Also, military training is second to none, so they would be excellent additions." Bender Financial Group of Northwestern Mutual, which has offices in Westport, Fairfield and Wilton, is eager for new hires, as well as full-time students for internships. "The reason we're here is because our office is growing and expanding," said Susan Lewandowski, chief recruiting officer for the Bender Financial Group in Westport. "We do bring in a lot of military veterans. They're very coachable, and if we're going to take someone and groom them, we want someone who is able to listen. The first year here is really about immersing yourself in the business." Sometimes, though, the easiest transition is to a line of work that will retain the military structure. Staff Sgt. Juan Garcia, at a booth representing the Connecticut Army National Guard, said that's precisely what he did. The National Guard offers the chance to remain in the same military career path or branch out into a new one, without the long deployments and time away from home, he said. "I was in active duty and I wanted to still have the camaraderie of the team, while still being in my state," Garcia said. "We're representing an opportunity for previous service members to continue serving their community. Once you experience active duty, it's hard to go back to being a civilian, and I think it makes the transition easier."